Don't believe those who say the Epiphone Les Paul is not top-notch, or nearly so- the only thing that disappoints are the pickups, and even they are decent. I upgraded the pups to Gibson Burstbucker Pro's- nothing else was needed. I upgraded the tuners, but only because I had a set of Gibson bell-knob tuners that looked cooler- the original Grover tuners (branded, not copies) were as good as the ones I put on. I decided to wait to see how the pots, switch, caps and wiring, and the nut, performed, and now, three years later, with considerable play, they are all working just fine. Don't let anyone tell you Agile, SX, or anybody else's LP is better- it just is not so. If these were not made in Indonesia, they would be perfect. Exact copy of the Gibson Les Paul in body and neck shape- easy to play, if a bit heavy. Works fine with any amp I have played it with. Black, ivory and chrome color scheme avoids glitch and flash. 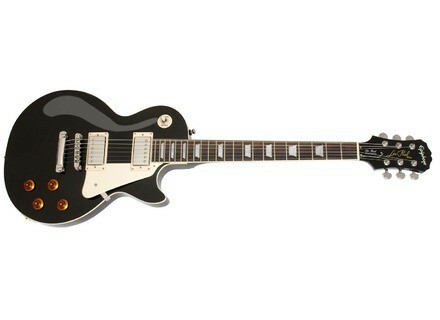 This is what a Les Paul should look like.